He was the great grandson of the "Maharal of Prague". He was the youngest disciple of the maggid. Devorah Leah, R. Shenur Zalmans daughter, was Menechem Mnedels mother, meaning he was the Alter Rebbes grandson. -Soon to marry Reb Gershons sister, Chana. -The exact dates are unknown but Chana & the Besht had a daughter named Odelle and 15 years later had a son named Tzvi Hersh. The Baal Shemtov asked" When will Moshiach come?!" and he was answered " When the wellsprings of Chassidas are spread!!" When Schneur Zalman reached the age of three years, his father, Rabbi Baruch, took him to the Baal Shem Tov for the traditional haircutting ceremony. That was the only time that Rabbi Schneur Zalman saw the Baal Shem Tov in his life, though he was fifteen years old when the Baal Shem Tov passed away. It was the Baal Shem Tov’s wish that Rabbi Schneur Zalman should find his own way of Chassidus. He was only 8 when he Composed a commentary on the Chumash, based on Eben Ezra, Rashi and Ramban. At his bar mitzvah he earned the title of Rav after saying a maamor about rosh chodesh. He passed on the first day of Shavous. He took over the next day, but exactly a year later his father the Baal Shemtov, appeared to him in a dream and told him that the Maggid of Mezritch, one of the Baal Shemtovs students shall replace him. The next day, at the meal Tzvi announced this. He died on the 19 of Kislev 1772. He was a disciple of the Besht. He taught Rabbi Shneur Zalman of Liadi. Rabbi Schneur Zalman was part of the group. 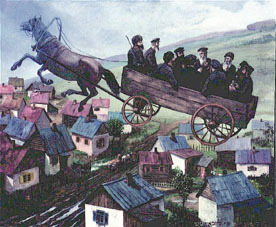 But when the caravan reached the city of Mohilev on the Dniester River (Mohyliv-Podilskyi), Rabbi Menachem Mendel—whom Rabbi Schneur Zalman regarded as his teacher and mentor after the Maggid’s passing—instructed him to remain behind to serve as the leader of the chassidic community in White Russia and Lithuania. Subsequently, Rabbi Schneur Zalman retained close ties with the chassidic settlers in the Holy Land and labored to raise funds for their support. Edicts of excommunication, issued in the influential cities of Vilna, Minsk and Shklov, were publicized everywhere, inciting the population to persecute members of the chassidic “cult.” In response, Rabbi Schneur Zalman arranged for a debate to be convened, and there he vindicated the teachings of the Baal Shem Tov and the chassidic way of life. The debate was a momentous occasion, and many erudite young scholars joined the ranks of the chassidim. 3 days after Mnechem Mendels birthday she passes on & her father, The Alter Rebbe helps raise and educate him. Just a few years after the first arrest, the old charges were revived, and Rabbi Schneur Zalman was recalled to St. Petersburg for further investigations. He was detained there for longer than on the first occasion, but under much better conditions. In the later stage of his detention, he was even allowed to deliver chassidic discourses to groups of his followers. The assassination of Czar Paul I occurred while R. Schneur Zalman was imprisoned in St. Petersburg. Two weeks after his installation as the new czar, Alexander I issued a command to release R. Schneur Zalman. At 18, R. Menechem Mendel writes a book called "Roots of precept player"
In the summer of 1807 Sarah, the granddaughter of R. Schneur Zalman, married Eliezer, the grandson of R. Levi Yitzchak of Berditchev. The wedding was attended by R. Schneur Zalman, R. Levi Yitzchak, and a great multitude of their respective followers. Zhlobin is a village in Belarus, midway between Babruysk (Babroisk) to the northwest and Gomel (Homil) to the southeast. It is also midway between Liadi to the north and Berditchev to the south. He urged Jewish communities to organize trade schools where Jewish boys, espe­cially of the poorer classes, would be able to learn a trade. He also called on his fellow-Jews to learn agricultural work, dairy farming, and the like, re­minding them that once upon a time, when the Jewish people lived in their own land, they were a people of farmers, fruit growers and herdsmen. He urged that boys who did not show promise of becoming Torah scholars, should, after the age of thirteen, devote part of their time to the learning of a trade, or work in the fields, to help support the family. He's the successor of R. Dov Ber. Marries his niece, the daughter of his brother, Rabbi Chaim Schneur Zalman. His wife dies shortly therefater. His new wife is Rebbetzin Rivka, granddaughter of the the Miteler Rebbe. During the twelve years from 1827-1839, Rabbi Menachem Mendel concentrated his efforts on communal activities in the field of material aid; the protection of Jewish children from kidnappers and their maintenance in safety, and spiritual help for the cantonists. Rabbi Menachem Mendel devoted particular attention to the requirements of the Jewish conscripts in the Russian army. He ensured that there should be special representatives at every place where Jewish troops were stationed, with the specific aim of concerning themselves with the troops' moral conduct. These representatives were to encourage the soldiers and strengthen them from falling into the traps of conversion to Christianity laid for them by eager missionaries. Rabbi Menachem Mendel also worked for the support of needy Torah scholars studying at the Yeshivahs and advanced institutes of learning. He was arrested four times by the Czarist police. During the Russo-Japanese war he sent kosher food to the russian army. After Shabbat ends, of the Torah reading of Vayikra, eve of Sunday, 2 Nissan (the 21st of March), at 3:30 a.m., he passes away and is interred in Rostov, on the river Don. Rabbi Menachem Mendel married the sixth Rebbe's daughter, Rebbetzin Chaya Mushka, in Warsaw. (The Rebbetzin, born in 1901, was chosen by her father, the sixth Rebbe, to accompany him in his forced exile to Kostroma in 1927. For sixty years she was the Rebbe's life partner; she passed away on 22 Sh'vat in 1988.) He later studied in the University of Berlin and then at the Sorbonne in Paris. It may have been in these years that his formidable knowledge of mathematics and the sciences began to blossom. 12 of tammuz- Frediker Rebbe comes to America!
" America is NOT different!" Note that this is the same day that the Frediker rebbe passed away and only a year after is when the rebbe accepted leadership.